Alec Falkenham, a 27-year-old PhD student at Dalhousie University in Halifax, has invented a special cream that will wipe out tattoos for good, without the pain and scaring expected today following laser surgery. Time to erase your ex-lover’s name off that shoulder… or keep it! Good or bad memories are what make you the person you are today, you shouldn’t be ashamed of that. Either way, soon enough you might have the means to make your own choice – one that doesn’t involve burning you skin. Tattoos are permanent not because they’re inked too deep in the skin. The ink stays there because your immune system and the molecules that make the tattoo ink are constantly locked in a tug. As such, tattoos are actually permanent inflammations! When a tattoo needle punctures the skin, it rips through the epidermis, the outer layer of skin, and spills ink in the dermis, the inner layer of skin which is flooded with blood vessels and nerves. With each penetration, the immune system is alerted there’s a wound going on and immune system cells are sent to the site. Some of these are macrophages which gobble up the ink in an attempt to clean the area. What’s left of the ink becomes absorbed by skin cells called fibroblasts. Most of the fibroblasts and macrophages alike become suspended in the dermis where they’re locked permanently. The dye in both cells show through the body which is why you can see your tattoo in the first place. Falkenham’s works its magic by targeting those macrophages that stayed put and are embedded in the skin. New macrophages move in to consume the previously pigment-filled macrophages and then migrate to the lymph nodes, eventually taking all the dye with them. Eventually, these make it to the liver where they’re readied for excretion. The student is not yet certain how many applications of the cream are necessary for a complete fade away. In fact, we’ve yet to see any pictures or demonstrations for that matter, but allegedly the cream has been tested on tattooed pig’s ears with success. It might sound too good to be true, but it might just work. Currently, the best way to get rid of a tattoo is through laser surgery. Basically, lasers producing short pulses of intense light every 0.000000000001 seconds pass harmlessly through the top layers of the skin to be selectively absorbed by the tattoo pigment. This laser energy causes the tattoo pigment to fragment into smaller particles that are then removed by the body’s immune system. It is very painful, however. Those who have gone through it described the experience akin to hot specks of bacon grease on your skin or being snapped by a thin rubber band – constantly! Of course, not all pigments will be removed, far from it. What you get instead is a “nice” scar. “When comparing it to laser-based tattoo removal, in which you see the burns, the scarring, the blisters, in this case, we’ve designed a drug that doesn’t really have much off-target effect,” Falknham said. Falknham is currently working with his University’s Industry Liaison and Innovation office to patent his technology and ready it for market production. “Alec is a trail blazer in tattoo removal. He came to ILI with an idea, tangentially related to his graduate research, that had real-life applicability,” said Andrea McCormick, manager, health and life sciences at ILI in a news release. 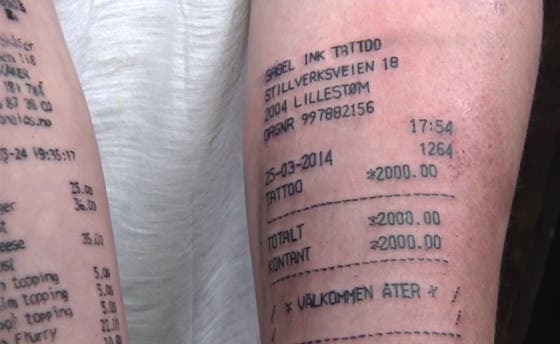 Falkenham estimates a tattoo removal treatment will cost four cents per square centimetre, so a typical a 10-by-10-centimetre area would cost approximately $4.50 per treatment.